* Information contained in this news release is current as of its date of announcement. Be aware that information contained herein is subject to change without notice. 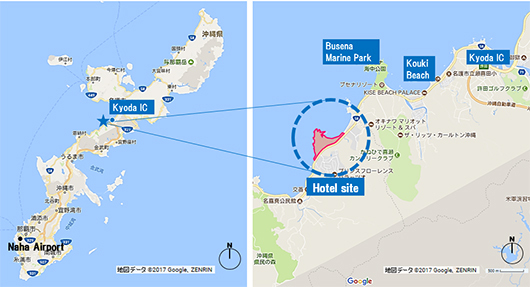 Mitsui Fudosan Resort Management Co., Ltd.
Tokyo, Japan, October 23, 2018 - Mitsui Fudosan Co., Ltd., a leading global real estate company headquartered in Tokyo, announced today that it has decided on July 26, 2019 as the opening date for Halekulani Okinawa, which is under construction in Onna Village, Okinawa Prefecture. The hotel will start accepting reservations before it officially opens from February 2019. For 100 years since its founding in 1917, Halekulani has welcomed countless repeat visitors with its prime location on the Waikiki beachfront, timeless elegance, and warm hospitality. “Halekulani” means “House Befitting Heaven” in Hawaiian, and the hotel provides guests with a sincerely delightful stay in keeping with its name. Halekulani Okinawa, the second Halekulani hotel, will make its appearance in Onna Village on the main island of Okinawa, which has some of Japan’s most beautiful beaches. The resort faces approximately 1 mile (1.7 km) of coastline, and features 360 rooms, each with a picturesque ocean view of a shining emerald sea and white sand beach. Situated in the Okinawa Kaigan Quasi-National Park, the abundant natural scenery of the resort can truly be described as a paradise. While the facility is a beach resort, it is set among lush Okinawan trees, and the eye is drawn into the glistening sea and greenery amid the sound of waves crashing on the beach. From the moment guests arrive at the resort, they are completely removed from everyday life able to the sparkling sea and the ocean’s roar as the setting sun sinks slowly beneath the waves on the horizon. The facility boasts expansive grounds covering approximately 936,460 ft2 (87,000 m2) in total, with landscaping carried out by Belt Collins Hawaii, which has a strong track record in landscaping for beach resort hotels around the world. Generous spaces have been provided throughout the resort so that all guests are encapsulated in stillness and quiet, while enjoying the therapeutic benefits of nature. All 360 rooms have at least 538 ft2 (50 m2) of space, and 47 rooms are refined and polished suites between 818 ft2 to 3,164 ft2 (76 m2 and 294 m2). In addition, five of the buildings are villas with their own private pools and natural hot springs. All Facility interiors have been designed by New York-based Champalimaud Design, which has a reputation for elegant motifs. The guest rooms have inherited the traditional Halekulani theme of “seven shades of white,” a classy and simple color scheme that sets off the sublime view outside the windows. 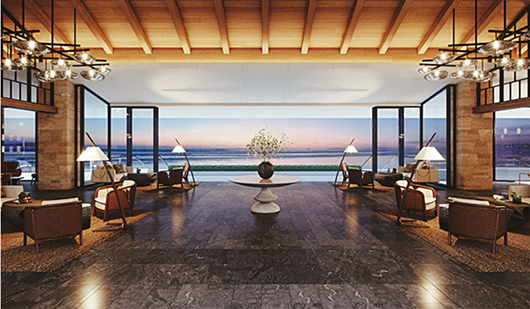 In every space, the elegant design melds with the sea and sky, symbolizing the style of Okinawa’s new luxury resort. The hotel houses four signature restaurants: All-day Dining, Innovative, Steak & Wine, and Japanese Cuisine. These offer a host of unique, highly original dishes that bring out the full flavor of ingredients from all over Japan, including local Okinawan foods; some dishes you can’t eat anywhere else. The Innovative restaurant has decided on the appointment of Two-Star Michelin chef, Hiroyasu Kawate (Florilege) as a consulting chef. Halekulani Okinawa offers a stay experience on a whole new level of diversity and luxury provided by an impressive array of facilities. 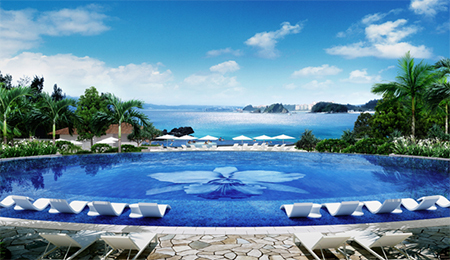 These include a beachfront of glistening white sand extending along a north-south direction, five different style indoor and outdoor swimming pools, including a pool adorned with around 1.5 million mosaic tiles in the shape of Halekulani’s signature orchid and one of the most prestigious spa facilities in Japan with a bath fed by a natural hot spring. 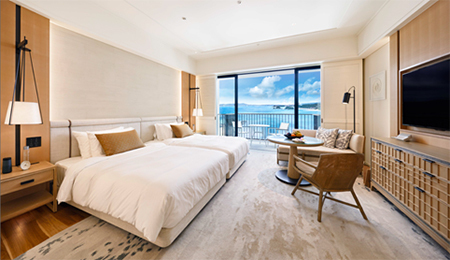 Halekulani Okinawa will inherit the accumulated traditions and spirit of Halekulani, while making full use of the attractions of Okinawa, such as its abundant nature and culture, aiming to create a one-of-a-kind luxury resort. 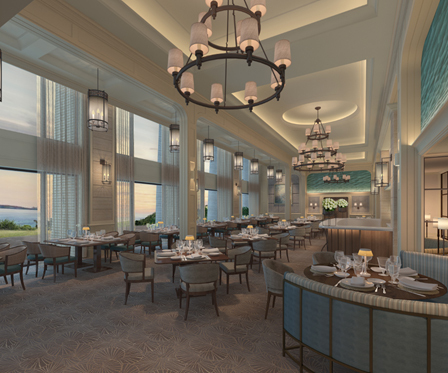 Mitsui Fudosan will provide spaces and hospitality that will make guests want to come back again and is eagerly anticipating the first guests. *1 Innovative offers the chef’s highly original French-based cuisine designed to bring out the full flavor of the ingredients. * All perspective drawings in this news release are computer generated images. *2 Career Profile of General Manager Jun Yoshie Joined PRINCE HOTELS, INC. in April 1983. Subsequently worked as Director of Marketing at Grand Hyatt Tokyo, Director of Sales & Marketing at Mandarin Oriental Tokyo, Executive Assistant Manager and Sales & Marketing at The Ritz-Carlton in Tokyo, General Manager at The Ritz-Carlton in Okinawa, and was appointed as General Manager at Halekulani iOkinawa in November 2017. *3 Career Profile of Executive Chef Hiroshi Takahashi Joined PRINCE HOTELS, INC. in March 1984. Subsequently worked at Hilton Tokyo Bay and Park Hyatt Tokyo before appointment as Sous Chef at The Ritz-Carlton in Tokyo in January 2007. Appointed Executive Chef at Halekulani Okinawa in July 2018. La Mer receives the AAA (American Automobile Association) Five Diamond Restaurant Award for the first time. Named as a Five Star Restaurant by Forbes Travel Guide for the 6th consecutive year. 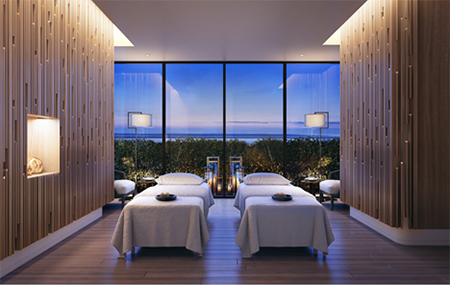 Received the Four Star Spa Award from Forbes Travel Guide for the 9th consecutive year. 2199 Kalia Road, Honolulu, Hawaii 96815, U.S.A.
© 2018 Mitsui Fudosan Co., Ltd.